Decide specifically what it is you want. Identify, as goals, two things you want to accomplish this year. Keep in mind; a persons’ reach should exceed one’s grasp. In other words, set goals that will be challenging to reach. Writing down your Dreams and Goals is an important first step towards achieving them. 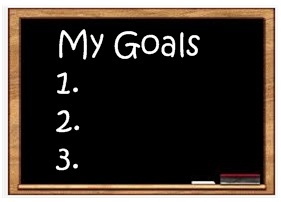 First, because by writing them down it forces you visualize your Goals. And second, because the act of writing them down creates a commitment on your part. Only about 5% of the population actually takes the time to write down their Goals and Dreams. Give your goal the “control test.” Do you have control over what you want to do? Does the action part of your goal tell what you will do? You have control over a goal such as “I will learn to identify ten kinds of trees on my property this fall.” However, if the action mentioned in the goal is what someone else will do, it does not pass the control test. The goal statement, “I will win the first place trophy at the horse show,” does not pass the control test because the judge provides the action that decides who will win the high point trophy. Do your goals pass the control test? After you identify each goal, think about what you need to do to reach your goal. Where are you now? Take a current inventory. You will never know how far you have to go if you do not know where you already are. Do you need to read or do research about something? Do you need to learn a special skill to meet your goal? How much practice will it take? Also think about who will help you reach your goals. Identify all the skills, information, knowledge, resources, and help from people and organizations that you will need to achieve your goals, and the people with whom you will need to collaborate. What skills do you need to achieve this goal? (Skills are things you physically do such as throwing a baseball and hitting a baseball). Make a list of anticipated obstacles. List the obstacles to overcome in accomplishing your goal. What can block my progress? If you are aware of the obstacle you can make plans to overcome it. You will need to break things down into smaller tasks. 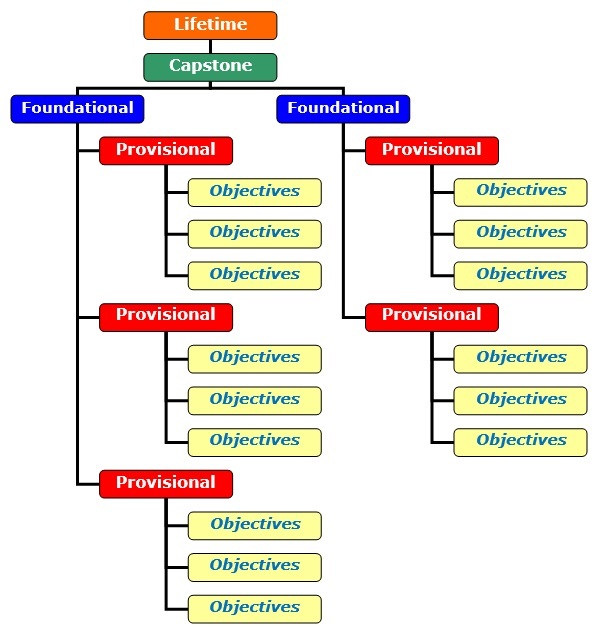 Objectives are the practical steps needed to help you achieve your goal. Goals have a deadline. They are broken down into steps, with each step having its own deadline. When all of the separate deadlines are reached, the overall goal has been achieved. 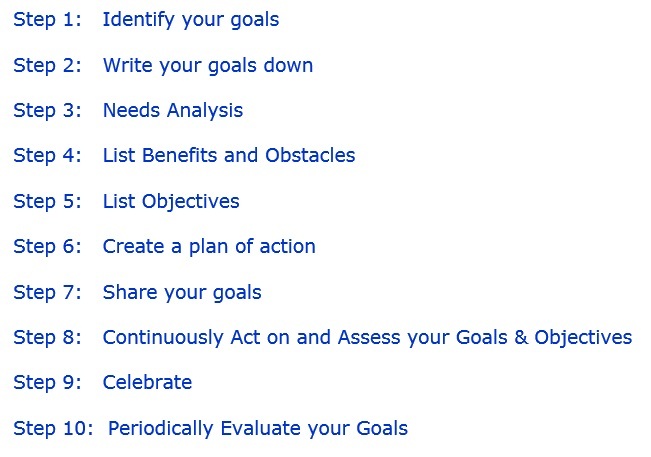 Develop a plan of action to complete each objective and reach your goal. Set up a time frame for your goals and objectives. Break each stage into basic tasks. List the primary things that need to be done first. Develop an action plan. Determine the specific steps that will be necessary to achieve the goal. Start at the accomplishment of the goal and work backwards. Talk about your goals with another. Share them with your friends and your family. When we talk to others about our goals, it helps us get a better idea of what we are going to do. Post your goals where you and others can see them. Take daily action towards the goal. Dreams and goals require action. The best goal in the world will never materialize unless consistent action is taken. Reward yourself for your successes. Once you have made progress toward or reached your goal, you should celebrate and be proud of what you have accomplished. Every now and then, think about how you feel about your progress. Sometimes goals are hard to stick to. It takes a long time to see results. So as you complete a step and meet a deadline you need to give yourself a boost or energizer. Goals do not occur in isolation. We have many different goals in our lives, and we need to figure out how to set priorities and still reach our different goals. Although you have assessed your goals on a constant basis, you must also take some time to evaluate your goals and your progress. Assessing entails making small adjustments to your objectives. Evaluating your goal entails reviewing your entire goal to ensure you are heading in the right direction, need to adjust time frames, or if you no longer have this goal in your life. 1. Do I have any goals that are in conflict? Will pursuing one goal prevent or make it difficult to reach another one? 2. 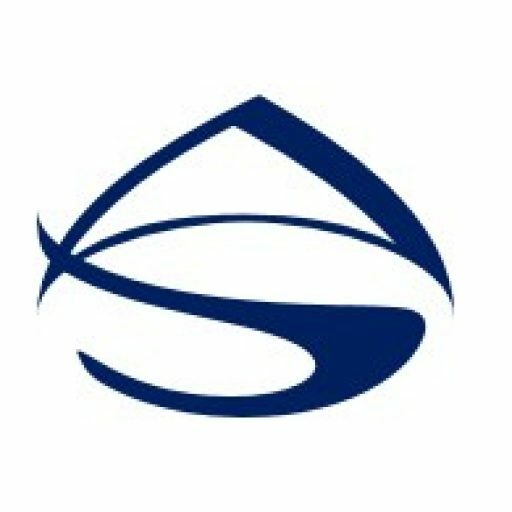 Am I committed to my goals? If one of your goals is to earn a six-figure income and another one is to get a degree in social work. You may want to run a marathon, but unless you are willing to invest the time and energy to train and prepare properly, you are not committed to it.